For the best results, putting together a good smoked turkey brine makes all the difference. Combining everything in a bucket and stirring works, but isn't the best method. By simmering the salt and seasonings first, your brined turkey will be a smoked masterpiece. The brine should ideally be made a day ahead of time. This allows the flavor additions a chance to infuse the brine, and it also insures that the salt and sugar are completely dissolved. 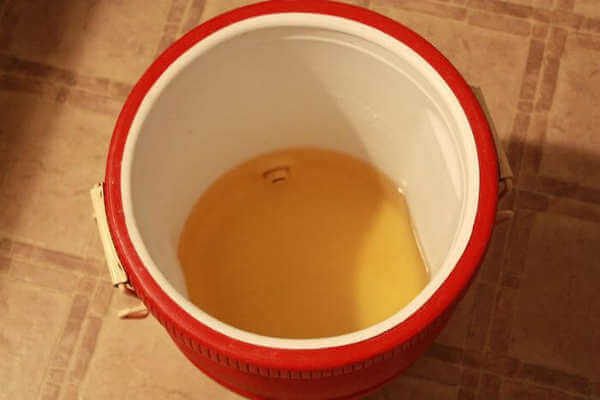 For a container, a food grade 5 gallon bucket works fine. You'll need to have plenty of space in your refrigerator, because that's where it will need to be for couple of days. Better still is an insulated water cooler, the kind you see on road-crew trucks in the summer. The shape and size of these coolers is perfect for brining a whole turkey, and being insulated, the turkey and brine can be kept cold with bags of ice. What Type of Brining Container Is The Best For Turkeys? THE INSULATED WATER COOLER KEEPS BRINE COLD FOR HOURS! A standard turkey brine contains the right kind of salt , sugar and seasonings. Normally, between three quarters of a cup and one full cup of salt is used per gallon of water. By varying amounts and types of sweeteners and flavorings you can adjust the flavoring to your taste. Add one gallon of water to each of two stock pots or large, lidded pans. To one of the pots, add the salt and sugar. Bring this to a boil, and boil it for five minutes. Remove it from the heat, cover, and let it cool. To the other pot, add the spice, herbs and vegetables. Slowly, bring this pot up to a light boil, simmer for five minutes, remove from heat, cover, and allow to cool. 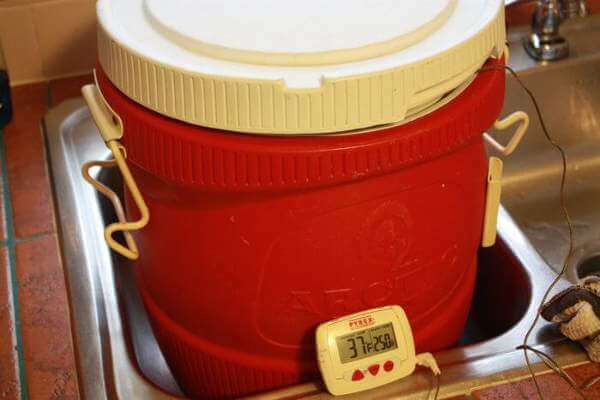 When both pots are cooled to room temperature, add them to your five gallon bucket and refrigerate. After twelve hours, or overnight, the brine is ready for the turkey. The brine has to stay between 35 to 40 degrees Fahrenheit while brining the turkey. Over 40 is dangerous, and under 35 slows the brining reactions. For a 10-14 pound turkey, two gallons of brine is what you need if you use an upright brining container, like a bucket or a water cooler. If you use a normal box-shaped cooler, you'll need more than two gallons. 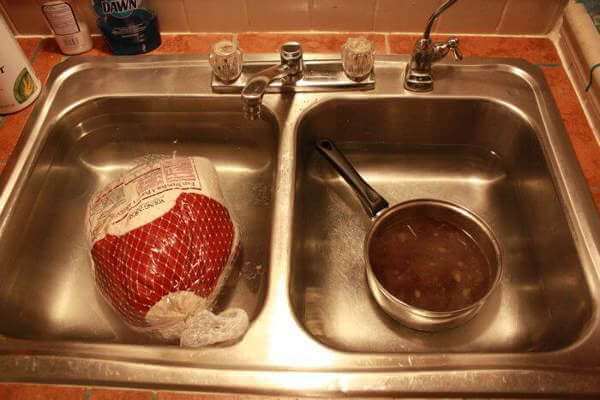 Whatever container you use, the turkey has to be completely submerged the entire time. A basic brine contains only three ingredients - water, salt and sugar. As the bird brines, some of its natural juices are pulled out and replaced with the brine solution. In addition to adding flavor, the salt and sugar make changes to the protein structure of the meat, improving its texture. This change also helps prevent moisture loss, making for a juicier, tastier turkey. A variety of different flavors can be added to this brine recipe. For some ideas, visit one of the following pages. To learn how to put these brines to good use, see Making Smoked Turkey, where you'll learn about turkey smoking from start to finish. And available from the USDA is an informative, downloadable PDF with additional poultry preparation information.